Do you want start up a sustainability project and reach others with your ideas? Then this is a course for you! This course gives you an introduction to project management models for working with sustainable development that combine different practical and creative tools in planning, implementation, communication and evaluation. The course is designed for students that independently want to plan and implement a project idea that contributes to a sustainable development. The project process is done individually or in a group, and is communicated within the university or in another relevant context. Ongoing Sustainability Projects at CEMUS and CEMUS Roots Meeting Tomorrow! We're really looking forward to seeing you all next week at the Second Progression Meeting on the morning of Tuesday 18th Nov at the CEMUS Library. Here are the times for the groups - there's no change to the time slots from the First Progression Meeting. If you need to change these time, please let us know in advance! The Second Status Report is also due in this Sunday (16th Nov), there are some supplimentary things to think about for this second report and the extended instructions imaginatively title Second Status Report Instructions are in the 'Assignments' sections above. 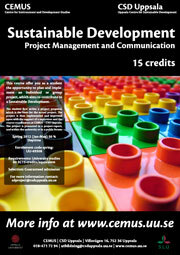 Those with a keen eye would have also spotted that the instructions for the Project Report are also now available. See you on next Tuesday! Remember, email us if you have any questions. Thanks for showing up this morning, a clerical error has meant that the schedule wasn't updated to reflect the latest times for the progressions meetings (today and on the 18th). The new schedule now uploaded shows that the Progression Meetings are held on Tuesday mornings, individual group times will be posted again nearer the second Progression Meeting.